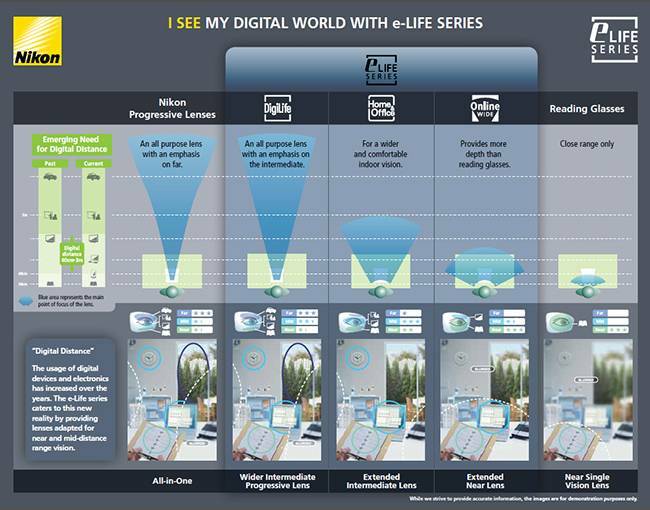 Nikon Digital Progressive Lens Technology. New! Home » Eye Glasses » Nikon Digital Progressive Lens Technology. New! OPTOMEYES Squamish and West Vancouver is proud to offer high quality Nikon lenses. Nikon Optical Canada manufactures premium ophthalmic lenses and world renowned coatings. With close to 100 years of experience developing legendary cameras and other precision optical instruments, Nikon has acquired unparalleled expertise in complex optics. Nikon is the lens company. Lens technology is constantly evolving and Nikon is at the forefront with its flair for precision manufacturing and its development of patented progressive designs. Nikon, the first manufacturer to produce digital progressive lenses in Canada, carries different series of lenses, each ahead of its time. The technology shared by these lenses makes them compatible with small frames for a global dynamic vision, a vastly enhanced field of vision and an improved visual ergonomy – while almost eliminating any adaptation period. This means that you, the wearer of Nikon digital progressive lenses, will benefit instantaneously from the smooth and large field of vision. For more information feel free to contact us at Optomeyes!